At Southampton Scuba Diving school you’re assured of a warm welcome with the promise of a safe, fun, professional, relaxed and friendly atmosphere. We enjoy teaching others to dive. So if you wish to learn, want to improve your dive skills or to find out more about what we have to offer, give us a call on 07866 597845. Scuba diving is an amazing activity. I started diving in 2009, and have been hooked on this thrilling experience ever since. I learnt to dive in the UK, and continue to dive here all year round - possibly the coolest thing I do! I've also dived at various locations around the world - see the photos in the gallery. I enjoy teaching diving and sharing the buzz with others, whether it is their first time or they are improving their skills. Since passing my Open Water in May 2012 I have become hooked on diving as a sport. Each year I've added to my training which in turn has added to my diving adventures. I dive regularly in the UK, Spain and my passion is the Maldives. Having a very busy life/work style means that at 18m plus there is very little use for iPhone's and iPad's, you don't even have to deal with the issues of traffic, trains or everyday life. You are just cut off from reality in an aquatic world that’s your own. My continued training has allowed me to successfully complete my Open Water Scuba Instructor. 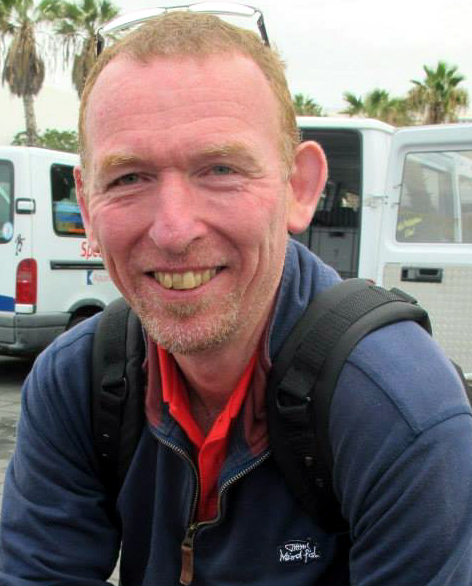 I started diving in 2003 in Gran Canaria and became an instructor in May 2007. I have dived in Barbados, Spain, UK, the Red Sea on liveaboards and off the coast of Saudi Arabia. I really enjoy the teaching and seeing the huge smiles on the students' faces during and after that first dive. I started diving in 2011 and did my open water in the UK. Even though it was a bit cold, I was hooked! 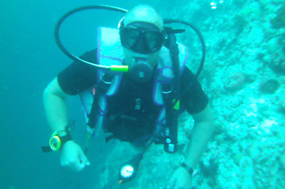 I then went travelling later that year and did my advanced open water in Thailand and since then have enjoyed it so much that I went on to progress to a DM. I regularly dive in the UK but have also dive in my country of birth, South Africa, where I've enjoyed a couple of shark dives. I mostly enjoy exploring wrecks nowadays as it is interesting to see something in an unusual environment, I'm also now looking at entering the world of technical diving and developing my skills and knowledge. I learnt to dive in Crete in 2011, and since then I've dived around the world including the Mediterranean, the Caribbean, United Arab Emirates and South Africa. I enjoy diving from a boat and prefer to dive to see fish rather than explore wrecks. I've dived the Knoll Pins in Lundy and will be going back there again this year. I had a fantastic diving holiday in Barbados last year, where I did a 40m dive onto the Stav, my first night dive, and also saw a big spotted Eagle Ray. I learnt to dive in the UK in 1999 to enable me to join a marine conservation trip to Tanzania and have been passionate about diving and marine life ever since. I’ve been lucky enough to dive in lots of places, including Ireland, New Zealand, Egypt, Cambodia and Lundy but there is so much more to see! I’d love to do some wreck diving in the Great Lakes, see manta rays and whale sharks and visit more of the UKs diving hotspots. Nothing comes close to the weightless freedom experienced while exploring our beautiful underwater world and its fantastic being able to help others discover this amazing sport though my DMT training. Southampton Scuba Diving are fully insured and our insurance details are kept on file with PADI EMEA Head Office. 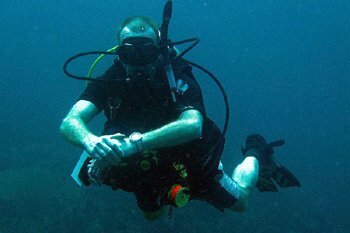 We operate within the guidelines of the Health and Safety Executive in all the diver training we give. The team undertake annual medicals with HSE approved Doctors as legally required and for your peace of mind. First aid kits and oxygen kits are carried at every training session and our team are Emergency First Response trained.